Barrie Roberts reports: My wife Katie and I have just returned from the WMA T&F Championships. 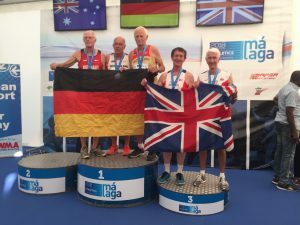 I was fortunate to be part of the GB&NI Team which acquired 203 Medals (80G, 66S and 57B).The host nation Spain amassed 80 Gold Medals as well, but the GB Team went above them by virtue of securing one Silver more. Germany, the USA and Australia made up the top five nations. In general I enjoyed the experience of competing against so many outstanding and talented athletes. However, at these particular championships, I tended to be ‘off the pace’ in the middle distances, and ran better over the longer distances. I did prepare for the Championships but, arguably, not well enough! 5,000m (track) – Very hot and humid (98%). I ran a SB in a time of 25:20.09. I was selected to run in the GB&NI 4x400m Relay Team and, to my surprise won a Team Bronze Medal. P.S. The next World Championships take place in Turun (POLAND), and it would be great to see some BvHers there competing. This entry was posted in Masters, Other races, Race Reports, Track by BvH Admin. Bookmark the permalink. Great report Barrie – well done on your achievements. ← Previous Previous post: Who’s ready for Cross Country Season?